One more look at the bridge with the longest main span in the world. Cable-stayed bridges are getting bigger but there are no plans to build a longer suspension bridge than the Akashi-Kaikyo Bridge in the foreseeable future. At 2 km long between 300 m tall towers, this is one big bridge. There is something interesting about big structures. The sculptor Claes Oldenburg took common objects like clothespins and made them hundreds of times their normal size in order to see them anew. Perhaps something like that takes place when we view a really big bridge. John Ruskin, the 19th century art critic wrote about how landscape art creates an intense aesthetic experience because familiar details are transformed when seen at a distance and because the object is changed by the distorting effect of the the atmosphere. These are just my first thoughts on the pleasures of looking at big bridges and other structures. I'd like to hear what you think! 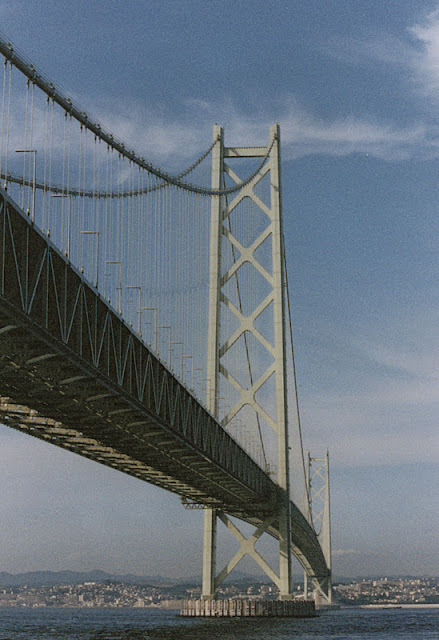 Honshu-Shikoku Bridges: Akashi-Kaikyo Bridge (3) by Mark Yashinsky is licensed under a Creative Commons Attribution-NonCommercial-ShareAlike 3.0 United States License. As a Bridge-Lover also, I must commend you on your beautiful site! I share the 'awe' of large structures not only because of their sheer size, but also in the complexity of assembly and the thought of the tremendous stresses being withstood. When we go through our 'design comps' we take for granted that the material that we assign to handle particular forces is sufficient and will behave as calculated. To see the huge scale to which this is accomplished is really amazing, and the Akashi Bridge stretches this concept to its 'extreme' limits.